*from Crosby, Stills & Nash title song, 1969. If you find this vision, below, of the late Talitha Getty (yes, married to that billionaire) lounging about on sumptuous pillows deliciously decadent, then maybe Marrakesh style is right for you! Artfully combining Spanish, Italian, Indian and African influences, this is not a style for the faint of heart or those without a taste for adventure. It’s exuberant and unique, working particularly well in a desert or tropical region, but really anywhere where the architectural style allows (not in Craftsman or Tudors, please). 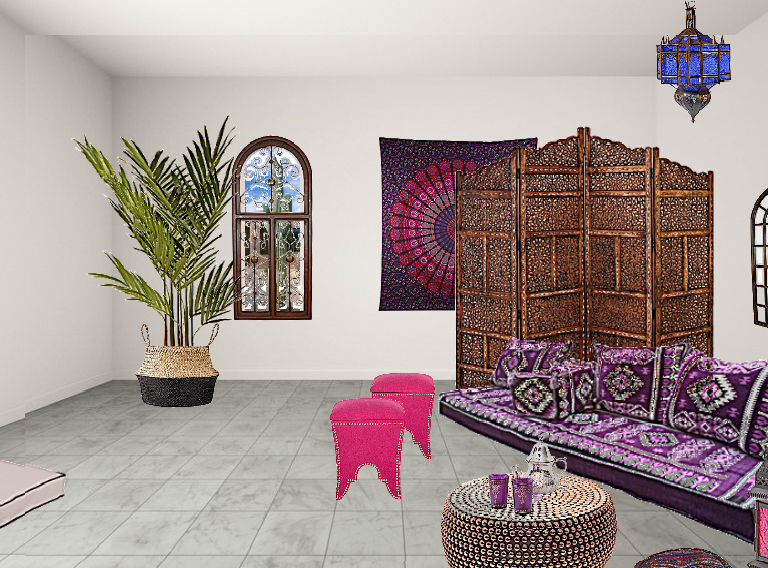 While the Marrakesh style may be heavy on the effort, you don’t have to be a Getty to do it right. Decor items are fairly low-cost as there is a lot of product online, at yard sales, and hippie/bohemian shops. 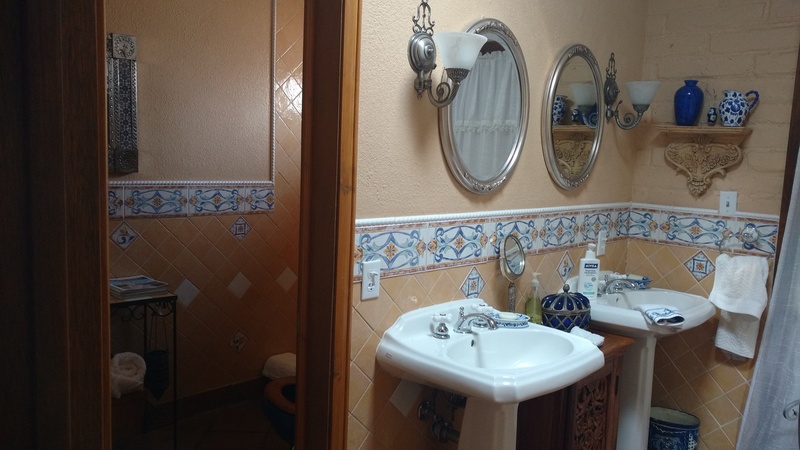 Not only is it a global style that instantly spells leisure, it also complements Mexican and Asian decor nicely. You can mix items happily because the idea is not to match (although you want to complement) to pull off a carefully-curated vibe. 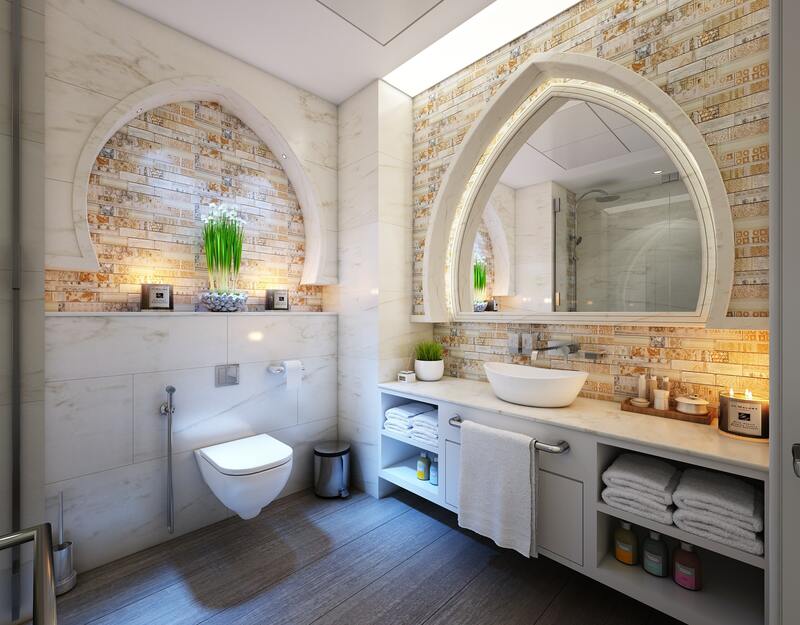 You can also go for a lite version by styling just one room, like in this master bath above with a hint of Moorish via mirror and wall frame shapes, with dramatic results. 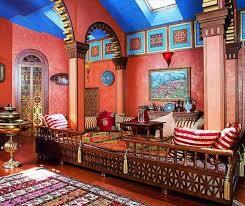 Below is a quick Casbah decor you can do on a budget. Note we limited the colors to blues/purples for a cleaner, more modern look. If elaborately-carved sofas are beyond your reach, use a covered blow-up mattress or wood pallets with lots of colorful pillows, plus thrift finds (these are nice HOUZZ products, but you can find them in many places), wall hangings and plants and…voilà: you’ve got a cheap ride on the Marrakesh Express from the comfort of your home.